Second grade is in full swing and this family couldn’t be happier! Well, one of the seven-year-olds could be happier but that would just go against her contrary nature so really, all is right with the world. Summer was super but I can only take so much fun and leisure time and, to be honest, keeping two girls occupied and entertained isn’t my strong suit. Homeschooling would be disastrous for us. So, we had a good time, made some happy memories and now it’s time to get back into a routine that, thankfully, the school has set for us. Along with school, my girls are also playing soccer and taking beginning ballet this fall so I have to really be on top of dinner plans or we will be in trouble. To help, I’ve dusted off my slow cooker and decided I will make a point of using it far more than I have in the past. This recipe took fifteen minutes to throw together in the morning and required only the time it took to boil pasta, grate some cheese and chop a little parsley when we got home. The big cheat here is the jarred marinara. It’s such a time saver and if you look for one with the fewest ingredients and the least amount of sugar you’re doing fine. I buy either Safeway or Trader Joe’s organic tomato basil sauce, the Muir Glen brand is good too but usually twice the price. If you have absolutely starving children, zero time and even less patience, you can skip the pasta altogether and serve the chicken ragu Sloppy Joe style over bread, buns or English muffins. If you want to avoid carbs and add more veggies, try serving it over some steamed cauliflower, zucchini “noodles” or spaghetti squash. 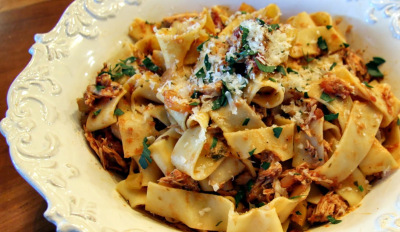 And, obviously, use whatever kind of pasta you want – my girls love the pappardelle! As a bonus, this should make enough that you will have leftover chicken ragu, we only used half, to freeze or keep in the fridge for another quick meal. Dice onion, celery and bell pepper. Cut chicken breasts in 2 – 3 pieces and place on top of vegetables. Evenly sprinkle oregano, basil, red pepper flakes, salt and black pepper over chicken and throw in the bay leaf. Grind the oregano and basil flakes with your fingers to release more flavor. Empty the jar of marinara over the top of the chicken but don’t recycle that jar and lid yet. Add wine or stock to the jar and shake to get all the excess sauce out and add to the sauce in the pot. Slice mushrooms (don’t forget to trim the bottom of the stem) and add to the pot. (You can also wait to add the mushrooms until about 20 minutes prior to serving as they cook quickly.) Cover the pot of the slow cooker and cook on high for 6 hours or on low for 8 – 10 hours. Go do whatever it is you do. About 30 minutes before it’s time for dinner, bring about 4 quarts of water to a rapid boil. Meanwhile, grate the cheese and chop the parsley. Using two forks, shred the chicken in the sauce and keep warm. Cook pasta according to instructions on package or 10 -12 minutes until al dente. Throw a few pinches of salt in just before adding the pasta. Stir occasionally to separate noodles – I like tongs for this but a large spoon will work. Before draining pasta, I always scoop out and set aside a little of the starchy pasta water to use in my sauce if I need it. You may do the same if you like. Drain the pasta but do not rinse it, you don’t want to wash away the starch that helps to bind the sauce to the pasta. In a large bowl, toss the pasta with about half the chicken ragu (Freeze or refrigerate and use the remaining ragu for another meal!) and the Parmigiano Reggiano. If it seems dry, go ahead and add some of the reserved pasta water (I didn’t end up using any this time). Garnish with parsley and serve.